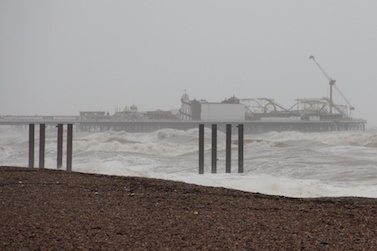 Its was certainly windy on the promenade in the run-up to Xmas in the English seaside town of Brighton. Was it snow for Xmas? 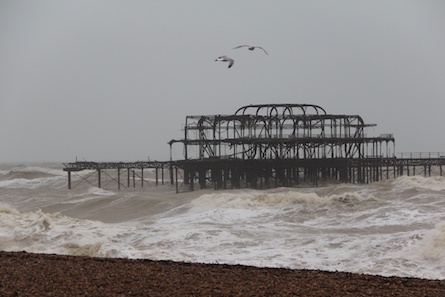 I needed to visit Brighton two days before Christmas day, and decided to walk along the seafront, what a mistake. 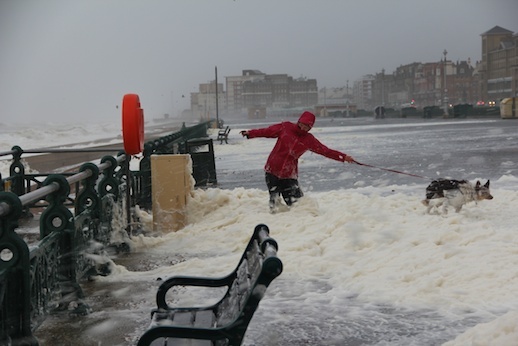 It appeared to be snow on the promenade, as my photograph shows the woman fighting the wind whilst hanging onto her dog, she seems to be knee deep in snow, but actually it is foam being driven off the waves off the wild sea. We had been warned of adverse weather conditions, with winds of between 60 – 90 mph (96 – 145 km/h) and heavy rain all over the UK. The waves lashed the pebbled beach and the high wind blew the white crests into the foam, which mixed with the rain flew parallel onto land, stinging the face, and inhibiting any forward flight the seagulls were trying to make. I was drenched from head to foot within seconds, and at times found it difficult to keep my footing. I only spent a short time on the seafront being quickly soaked to the skin and a train journey to take back to home. With warnings of possible transport delays due to the severe weather, trees being uprooted, lorries being blown over, and changing trains at London’s Clapham Junction, I was not surprised to hear that my train had been cancelled back to Norbiton. Little did I know the cause was a bus having its roof sliced off as it went under the low railway bridge at Norbiton Station, which resulted in many roads in the vicinity being closed. This meant a long walk around back streets, in more driving rain, by-passing the wreck of the bus. Now I am in my warm home as the storm rages outside, and the storms are predicted to continue into Christmas Eve. I will not venture out. Good job I have cooked enough food to keep me fed over the Xmas period.